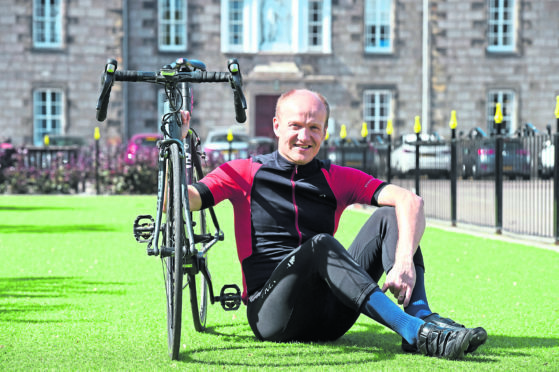 An Aberdeen cyclist won his battle against the sun as he completed a roundtrip to Peterhead to raise funds for children in Kenya. Mat (corr) Northcroft, from the Mearns, completed the North East 250 cycling route in an impressive 17 hours and 10 minutes. The scenic route, which launched last year, takes in mountains and moors across the north-east. Mr Northcroft, 44, left at sunrise on Saturday, and cycle to Glenshee before he turned north and travelled over the Lecht and towards the coast at Spey Bay. He then skirted the coastline to Peterhead then returned to his starting point in Peterculter before the sun set. Mr Northcroft took on the challenge to raise money for the Gathimba Edwards Foundation (GEF) which supports the education and shelter of children in Kenya. He said: “It was great, it all went really well and luckily the weather was great as well. “I had a pal out and he cycled quite a lot of the route with me which is always a real benefit because you can give each other support out on the road. “The roads were great as well and I was really impressed with the route itself. “You know Deeside is great and the hills are dramatic and the coast has got lots to offer, but I’ve never really gone round the area like that. Myles Edward, founder of the Gathimba Edwards Charity, said: “We had Mat and his family help us build houses in 2015 and we really valued their help. GEF is taking a team of volunteers to Kenya in July to build four houses each with a sustainable piece of land attached so it can be leased to grow food to eat and sell. They need to raise £30,000 for the materials and land. Mr Northcroft raised £1,300 during his cycling challenge, but it looking to boost that before calculating the final total.